Bhavanbhai Patel stood facing his farm, as dry and cracked as his hands. 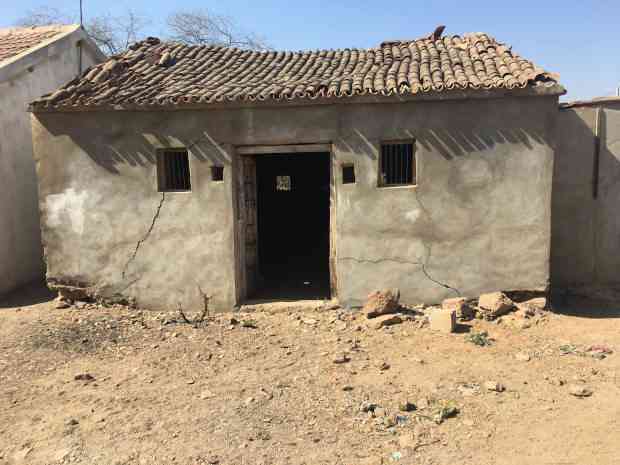 The 65-year-old lives in Dayapur village in Lakhpat taluka of southern Kutch, which has been receiving erratic rainfall since 2003. His farm comprises a few hectares of green, bright amid the sunburnt fields all around. “The rest belongs to my family, but now only I’m left here out of 10 brothers. Everyone else has gone,” the farmer told IndiaSpend in early February. Dayapur is 520 km from the Narmada Main Canal, but has not received any water from the canal in the 71 years since its foundation stone was laid, promising to bring the waters of the Narmada river to the parched Kutch, Saurashtra and North Gujarat regions of the state. Already facing years of drought, these regions have seen no rainfall so far in 2019. The India Meteorological Department recorded that Kutch saw a 99% departure from normal climate conditions, while other regions’ rainfall deficit is 100%. This story examines the situation in Gujarat’s worst-hit Kutch region, where scanty rainfall and rising temperatures have exacerbated competition for scarce water between farms on the one hand and cities and industries on the other, while raising questions over why the Narmada Valley Project’s raison d’etre–to irrigate farms in Kutch, Saurashtra and North Gujarat–remains unfulfilled 71 years on. When the Narmada Valley Project was envisioned in 1946, the government’s plan was to harness water for irrigation and hydropower through construction of the Sardar Sarovar and Narmada Sagar dams, and over 3,000 smaller dams and canals. The first plan proposed that the Sardar Sarovar dam be built in two stages, 160 ft and 300 ft, which was later increased to 320 ft–the height considered necessary for the water to reach the arid Kutch and Saurashtra regions. After various disputes over water sharing between the states of the Narmada basin – Gujarat, Maharashtra, Madhya Pradesh and Rajasthan – the central government constituted a Narmada Water Disputes Tribunal on October 6, 1969 to settle the matter. Ten years later, on December 7, 1979, the Narmada Water Disputes Tribunal determined that 28 million acre feet or 34,537.7 million cubic metre equivalent to 94,623 million litres per day – was the utilisable quantum of water at the time, and awarded nine million acre feet (11,101.4 million cubic metre) or 32.14% of the total water allocation, amounting to 30,414.62 million litres per day, to Gujarat. Madhya Pradesh (65.17%), Rajasthan (1.8%) and Maharashtra (0.89%) would also receive water. The Narmada Water Disputes Tribunal also laid out the power allocation between the states. In Clause VIII of the award, the tribunal allocated 57% of power generated to Madhya Pradesh and 16% to Gujarat. The lower power allocation was meant to balance the extensive irrigation benefits to Gujarat. The Gujarat government also made a provision that only 11% of the total allocated water, i.e. 3,582.17 million litres per day (1.06 million acre feet or 1,307.5 million cubic metre), would be used for drinking water and industrial use in 135 urban centres and 9,633 villages in the state, including villages in Kutch, North Gujarat and Saurashtra regions. However, between 2013 and 2016, Gujarat has utilised for non-agricultural use more than 11% of the water it withdraws, according to the annual reports of the Narmada Control Authority, set up in 1980 to implement the Narmada Water Disputes Tribunal’s orders. As of 2016, the state was utilising more than 18% of its allocation to provide water for industrial and domestic use. Though 2018 was declared the worst monsoon season since 1901, Gujarat insisted it was not drought-hit until three months after the rainy season had passed. After months of terming its arid conditions as “water-scarcity”, the state government declared drought in 51 talukas in 16 districts in a press conference on December 17, 2018. 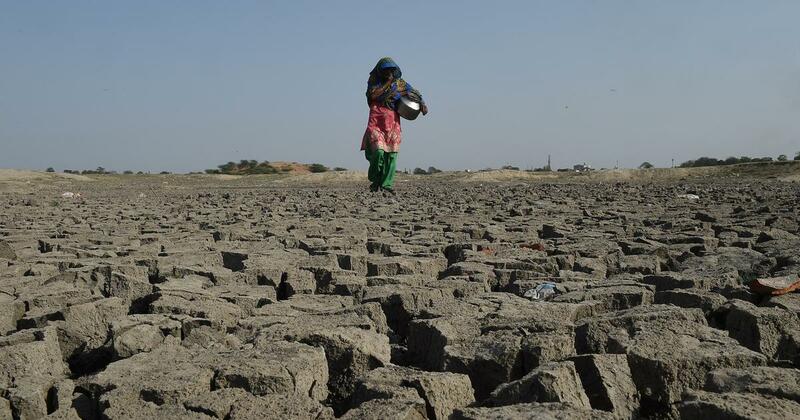 The declaration came two-and-a-half months after the state revenue department had declared drought and pointed out that conditions in five of 10 talukas in Kutch, including Lakhpat, had been assessed as “severe”. 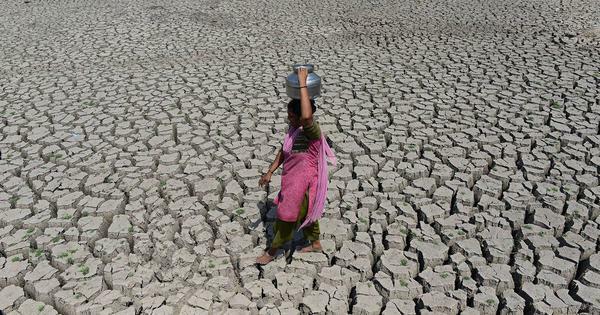 Of the 401 villages in Gujarat facing drought, the maximum number of villages with 50% or more crop loss are in Kutch district, as per the State Level Bankers’ Committee report released on December 13, 2018. 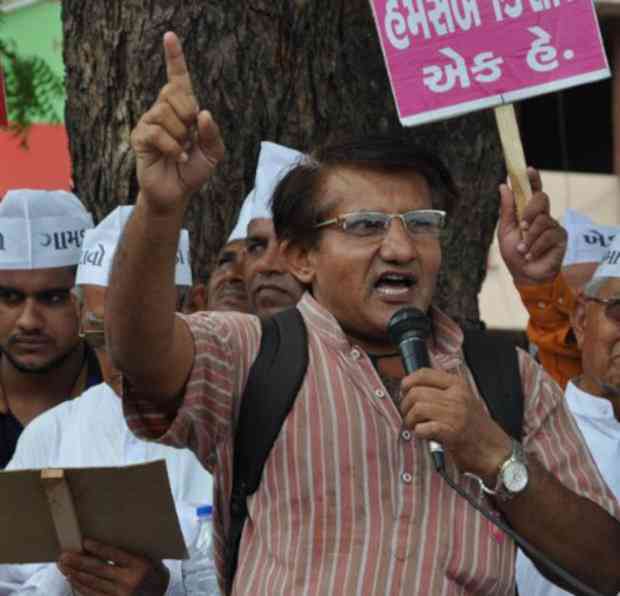 It was in response to one such set of questions, filed by activist Sagar Rabari under the Right to Information Act between 2014 and 2018, that the state government admitted that industries in Mundra and Kutch received 25 million litres per day of water from the Narmada Valley Project, and the cities of Ahmedabad and Gandhinagar received 75 million litres per day of drinking water – an amount that would irrigate 22,502 hectares of farmland for a day (calculated by farmer and activist Bharat Jhala), nearly twice the size of Chandigarh. While the quantum of water is within the 11% limit set by the state government, during this time no water from the project was released for agricultural purposes for Kutch, which was the project’s original mandate. “Ahmedabad is not part of the Narmada Main project,” Rabari told IndiaSpend, referring to the Narmada Water Disputes Tribunal 1979 award on allocation of water between the four states. Lakhpat taluka, where Patel lives, is not part of the Project’s Command Area, SS Rathore, the chairperson of the Sardar Sarovar Narmada Nigam Limited, which executes the irrigation and power generation project, told IndiaSpend. This could mean Lakpat may never receive water from the project, say activists. 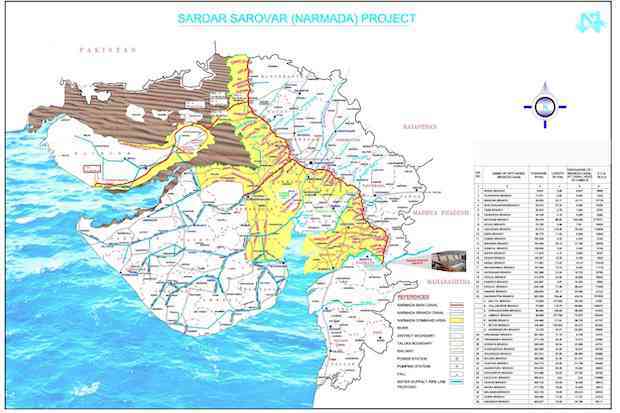 However, they insist that the taluka and many other villages were initially part of the project’s “command area”, but have been removed after numerous revisions that are not reflected in the updated Command Area map currently available on the Sardar Sarovar Narmada Nigam Limited website. Industries in the Kutch and Saurashtra regions are taking water amounting to 844.85 mld (0.25 million acre feet) against their allocation of 675.88 million litres per day (0.2 million acre feet). All the industries set up in these regions show the Sardar Sarovar Dam as their main source of water supply, while farmland remains parched. Kutch has witnessed a record heatwave over the last 15 years. In 2016, the temperature reached 50 degrees Celsius, the highest in 100 years. 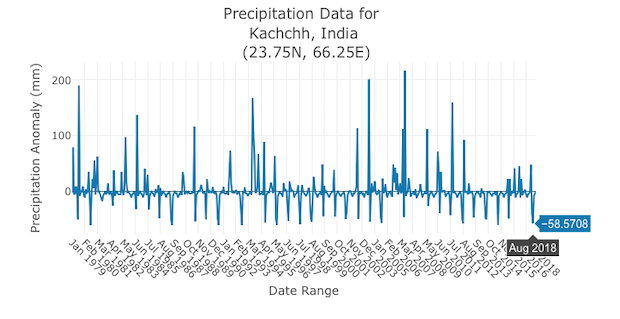 Kutch received only 25% of its annual average rainfall, according to the State Emergency Operation Centre data, in 2018. In 2017, Kutch was 56.58% deficit in rainfall on average, according to the IMD. Rainfall was sporadic and uneven throughout the year. During June and July, peak sowing season for kharif (monsoon) crops, Kutch saw only 58.9 mm and 295.4 mm of rainfall, respectively–averaging to only 5.9 mm of rainfall per day or 65% of the the entire summer rainfall in the area. The district also saw disastrous rainfall patterns during the rabi (winter) crop sowing months of October and November, with no rainfall in October and a 99% rainfall deficit in November. The district declared droughts in 2012-13 and 2015-16. Historically, Kutch has a drought-frequency of two-and-a-half years. This year, as early as April, mercury has soared in the district’s cities. 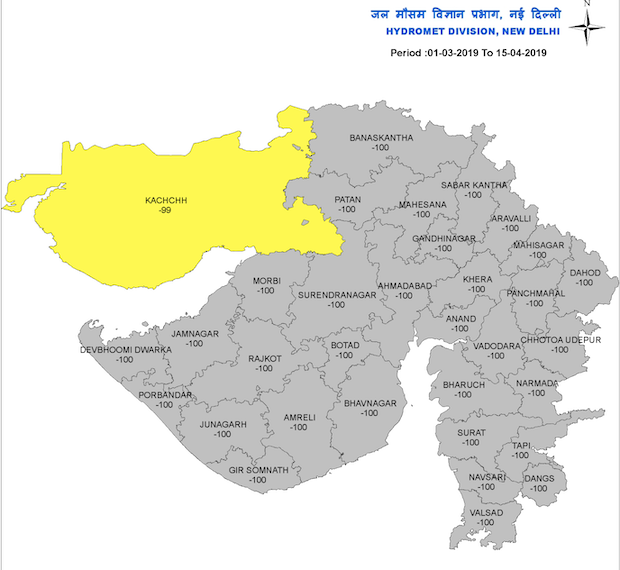 Bhuj, the district headquarters, saw a heatwave with temperatures soaring to 42°C on April 3. Lakhpat taluka hosts three cement factories including one of Sanghi Cement, India’s largest. Two power plants – one owned by the Adani group and the other by Tata Power–have been set up in the nearby district of Mundra. The state-owned Gujarat Water Infrastructure Ltd was constituted as a special purpose vehicle whose mission is to provide drinking water to Gujarat. Because it is an special purpose vehicle, it does not come under the RTI Act, Rabari told IndiaSpend, but he found that Sardar Sarovar Narmada Nigam Limited supplies Gujarat Water Infrastructure Ltd with water, which then distributes both drinking and industrial water, which is contrary to its mandate to supply only drinking water. “This is a big game that the government has played with the farmers,” Rabari alleges. The Narmada Valley project had a target of irrigating 1.79 million hectares through a 74,000-km canal network. However, 40 years after the tribunal award, only 36% of the network – 27,189 km – has been constructed. Even with a dam height of 138 m, enlarging the water reservoir to its maximum, in 2017-’18 Gujarat could only supply irrigation water to 628,000 hectares–less than half its target. However, Rupani’s Bharatiya Janata Party has been in power in Gujarat for over 20 years, Rabari pointed out. “The full drawing [Layout of the Project Command Area] and schemes and allocations had been done on the ground. Even farmers knew which khet would get water and which wouldn’t. That’s how much knowledge there was. So what happened?” he asked. The Rs 56,000 crore Sardar Sarovar project (by 2017 figures) met with strident opposition from local people and activists in Gujarat, which the government countered by arguing in the Supreme Court in a writ petition filed by the Narmada Bachao Andolan in 1994, for the necessity to bring water and prosperity to the parched farmlands of North Gujarat, Kutch and Saurashtra regions. On September 8, 2018, Rupani laid the foundation stone of the Saurashtra Narmada Avtaran Irrigation Yojana link-4, which is expected to fill nine dams with Narmada water and provide irrigation water to Saurashtra. 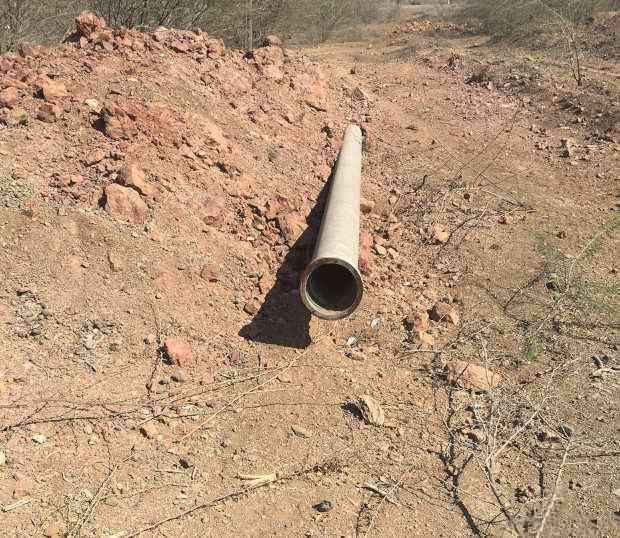 Within Kutch, a 59,934-hectare area has been set aside for the Kutch Branch Canal, but the pipelines have yet to be connected to form a viable network to deliver water. The slow pace of work on the Narmada Valley project was censured by the government’s auditor, the Comptroller and Auditor General of India, which found that the state government had fudged its accounts of expenditure incurred between 2014 and 2016 to the tune of Rs 213.17 crore. The government had included expenditure on power projects in its statements even though the Central Water Commission had explicitly stated that this cost would not be born by the Accelerated Irrigation Benefit Programme funding programme, the CAG report (22 of 2018) said. “Only 25% of our population is left. We who are left are just waiting for rain...You know how Sabri-bai used to wait for Ram, that’s how we wait for the rain,” Sura said, alluding to the legend of Sabari, a local tribal woman whose guru told her that she would be visited by Lord Ram, a promise on which she waited for decades, setting out plates of berries every day in hopes of his arrival. “In the village, everyone has 5-10 buffaloes, so the village has about 10,000 animals. There’s barely any water here so we can’t grow grass and so we can’t feed our animals. 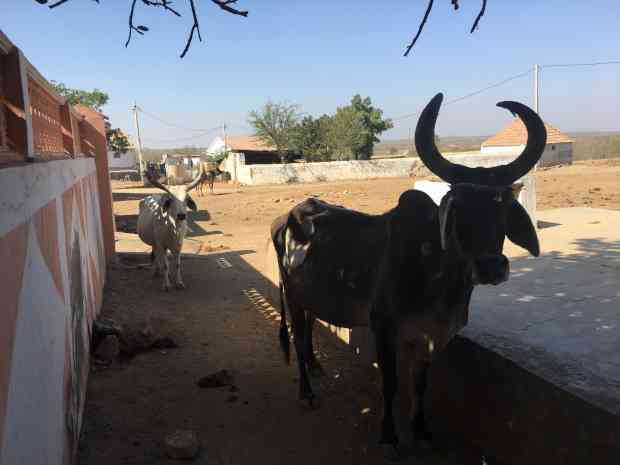 To keep them alive, every family takes half or more of the cows and buffaloes and migrates towards the northern areas of Kutch where there is more change of finding water,” he explained. To launch a fishing boat costs four to five lakh rupees, one villager told IndiaSpend, not wishing to be named. “So what can a fisherman do? If we don’t catch something, we have no way to pay back the loans we take. So wouldn’t anyone have to take the risk when the fish have migrated further?” he said. Dependent on piped water supply, Kutch district is affected every time a line breaks down due to lack of maintenance or due to climate variables. “We depend on the [pipe]line, but that also breaks every few weeks. Right now it’s been broken for four days and so we have not gotten any water. It’s a regular thing,” Sura told IndiaSpend. Gujai Pani, an Sardar Sarovar Narmada Nigam Limited employee in charge of overseeing the supply of water through these pipelines to 86 villages including Sayana, confirms Sura’s statement. “In the last four days the pipeline has broken down twice,” he told IndiaSpend. “We dig squares of four [cubic] metres and get paid Rs 200 for this. The wages are not paid daily but on the basis of work done, after it’s inspected,” 30-year-old Hajiani Jat explained. She and another woman Surmi Jat had not gone to work on the day IndiaSpend visited as they were feeling unwell and were frustrated because they had not been paid for 15 days. Surmi’s story is confirmed by a district administration functionary responsible for revenue collection, expenses, etc. of Kutch, deputy district officer Prabhav Joshi, who says her name appears on a list of persons who have not been paid wages. “We are trying to pay everyone as quickly as possible and in most cases we have managed to. But, there are sometimes unforeseen problems due to which a small number of villagers may not get wages on time,” Joshi said. He shared the district’s muster roll report from December 18, 2018 to January 1, which clock villagers’ person-hours to calculate their wages. The list showed that, on average, some villagers from Ravareswar were owed more than Rs 2,500 each – enough to feed a family of four for eight days. “There are factories nearby, such as Sanghi Cement. They don’t employ people from the village. The company had said that it would give the villages meetha paani [desalinated water] but instead they’re taking all the water for their own use,” said Pragji, the village sarpanch’s brother, who goes by only one name. The sarpanch was away visiting another village under his jurisdiction. Villagers said they were willing to work in the cement companies for as little as Rs 100 a day – a third of the minimum wage of Rs 312.2 per day for such work in Gujarat – but the corporates only hire people living close to their factories, Vishwanathan Joshi, a senior reporter for Kutch Mitra, a local Gujarati language daily, told IndiaSpend. The National Voluntary Guidelines on Social, Environmental and Economic Responsibilities of Business say companies should provide employment to residents of villages within a 15-20 km radius of their property. “They [the state government] want to divert the water [from farmers to industries], and once the water reaches the farmers, to take it back will be political suicide. They understand that. So, they’re delaying it so that water doesn’t reach the farmers so ultimately they can say that no one is living there so why make a canal?” Rabari told IndiaSpend. “On paper, Gujarat is a great state, it’s really growing, but that’s only true until you look at the actuals,” Rabari said. “The government’s intention is that if water reached Kutch then the people who have left will come back to farm and then there will no place for industries to build their factories in this area,” Lakhpat farmer Patel said.